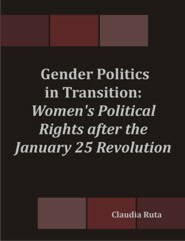 The book sets out the development of gender politics before and after the revolution of January 25, with a particular focus on the period between January and August 2011 in order to analyse how women’s rights have been progressing during the transitional period. The book locates the Egyptian case in a broader analytical framework derived from a brief comparative analysis of women’s activism in revolutionary struggles or independence movements in countries such as Algeria, Morocco, Iran, South Africa, and Chile. This enables the research to underscore and highlight which strategies adopted by women have enabled them to be recognized and included politically in the transitional and post-transitional periods of their countries. The book also reports the historical perspective of the feminist movement in Egypt, as well as the major events that happened during and after the Egyptian revolution regarding women's political participation, social activism and state politics. Finally, the book devotes considerable space to an empirical study of perceptions held by ordinary Egyptian men and women with regard to themes and issues related to women. Claudia Ruta holds a M.A. in International Relations from the American University in Cairo, and a B.A. in Intercultural Mediation from the University of Milan. She is a Governance Associate at the UN WOMEN Egypt Country Office and is currently working on projects related to the political empowerment of women.